It's a great thing when you get to play what you love, and even better to lay it down for all (well, almost all) to hear. Much is the case with Wyoming's Full Blown Mosey and their debut Temporal Cadence. The roots of the band members go back to gigs in high school with music influences as diverse as 70's rock, 80's metal, but also more modern notes from STP and Pearl Jam. Temporal Cadence evolved in 2004 when the band rounded out with new drummer Dale Ortega. Working out of a basement studio, FBM began recording the tunes you hear today. Then misfortune hit as Ortega took ill and later succumbed to his illness in 2006. 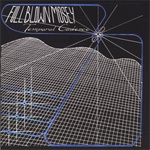 Tragedy often inspires, and it did so for Full Blown Mosey: they finished Temporal Cadence, and dedicated the work to him. But as much as Temporal Cadence celebrates Ortega's influence, it is also a testimony to the perseverance of the living. Full Blown Mosey serves up a solid platter of melodic hard rock on Temporal Cadence. The first and most obvious characteristic of this work is the exceptional production. The mix is clear and bright, something totally unexpected for an independent basement production. There's a high degree of diversity in the compositions as they deliver melodic rock on Mistaken or Crazy Desire to near melodic metal on Berserker and Time the Master (the best tracks in my book). Full Blown Mosey are also quite capable musicians. Expectations of average fret work dissolves quickly on Temporal Cadence as the solos are abundant and clever, and most notable on the aforementioned Berserker and the later Fast Moving Shadow. But the real highlight is the expressive and expert bass work from Kirk Warren. He kilss on every song especially, and again, Beserker and Time the Master. (I'll be passing this disc on to the next great bass player, my son, for a little practical application). Though the extent of the album is consistent, the meat of it seems to be in the middle six songs. Fans of classic melodic hard rock without the angst and excess of post-flannel modern rock should seek this album out. Good stuff. Full Blown Mosey serve up a solid platter of melodic hard rock on Temporal Cadence. Fans of classic melodic hard rock without the angst and excess of post-flannel modern rock should seek this album out.